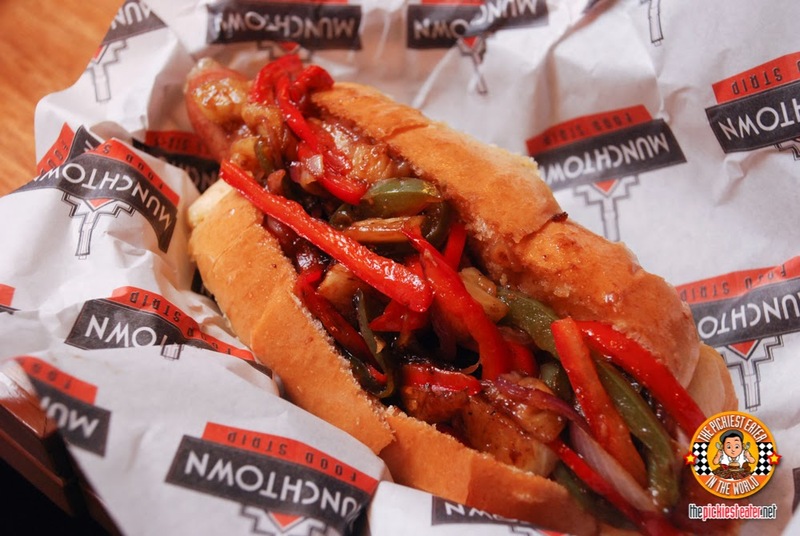 THE PICKIEST EATER IN THE WORLD: A PARADE OF HOTDOGS AROUND THE WORLD FROM MUNCHTOWN! I've always loved the messiness of chili con carne in hotdog sandwiches. It really appeals to me! 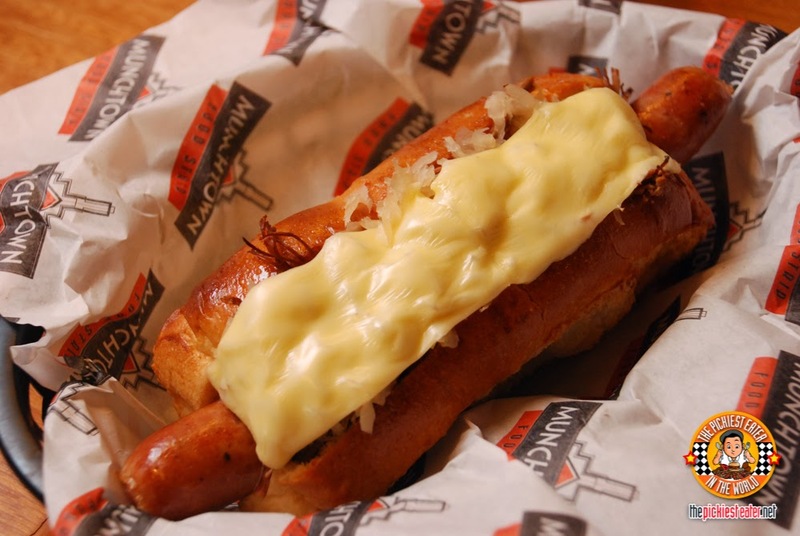 Munchtown's Chili con carne is home made, with a blanket of gooey cheese! I love gooey! 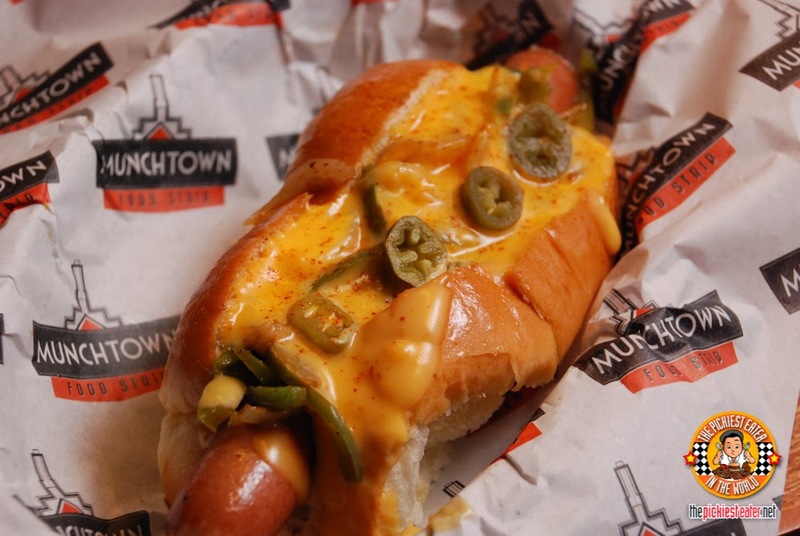 Munchtown's version of a New York hotdog! Simple yet satisfying! 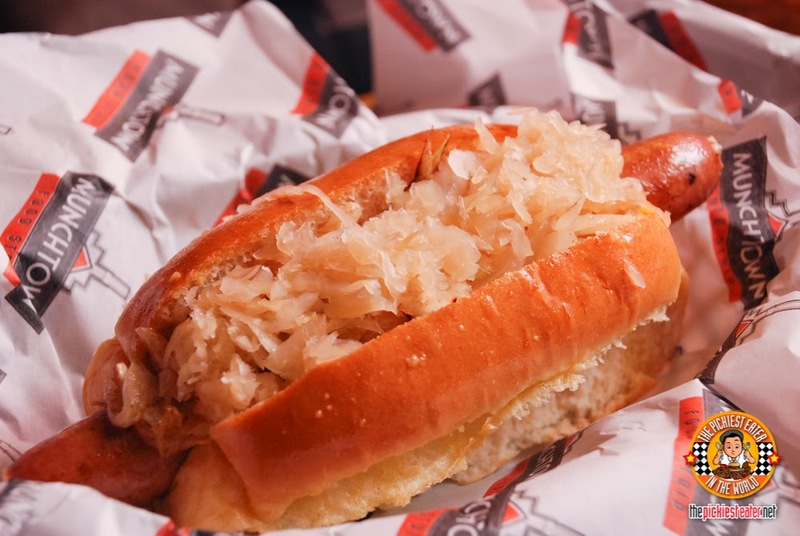 Just onions, mustard, and a whole bunch of sauerkraut. Fan of Reuben sandwiches? This one's for you! Enjoy a sandwich of corned beef with Swiss cheese, Russian dressing, and it won't be a Reuben hotdog sandwich without the sauerkraut! From New York, we move to Chicago! I haven't been but I would often see it in movies during baseball games, where a hotdog vendor walks around with a portable cart and throws hotdogs to his customers. Warning! It's quite spicy (I guess that's obvious based on the photo haha). I wasn't able to stand it. But for sure a lot of spicy lovers will really enjoy this! Plus, it's one of the prettiest! 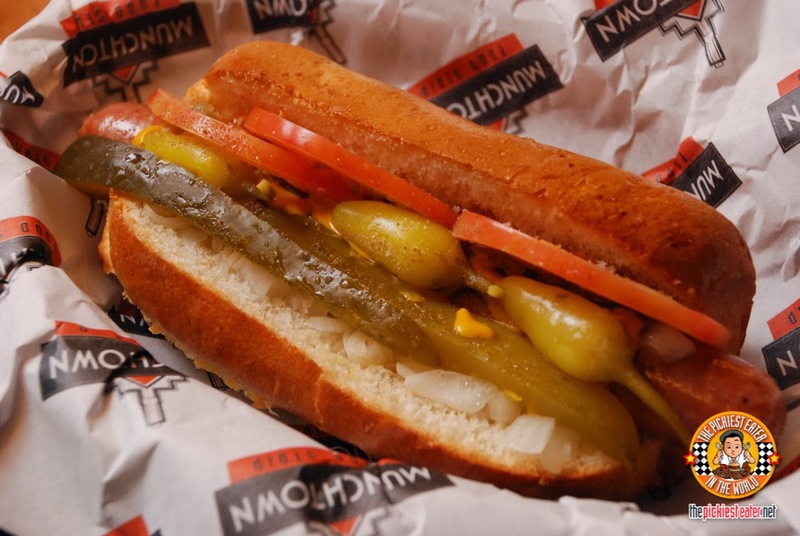 It has tomatoes, pickle relish, onions, banana peppers, mustard, sliced pickle spear, and then dusted with a bit of celery salt. Looking for something that has more greens? 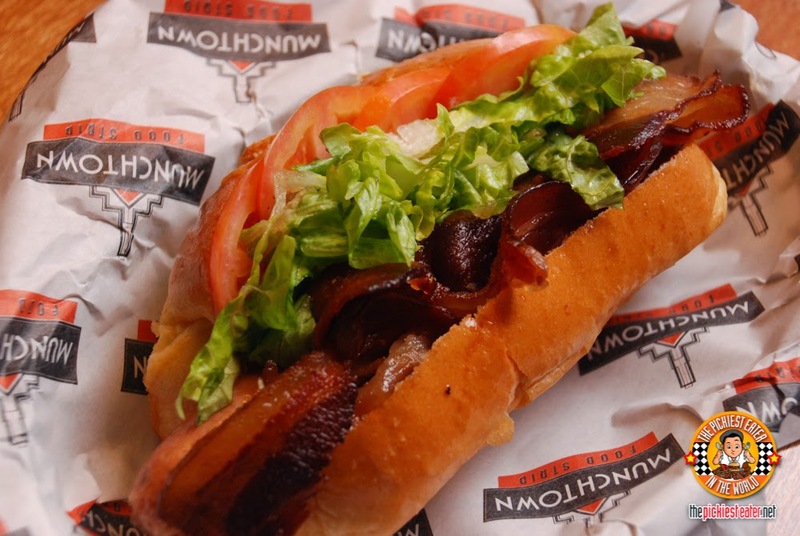 Then you can order the BLT Dog. Bacon, lettuce, tomato, and dog! Look at that bacon! 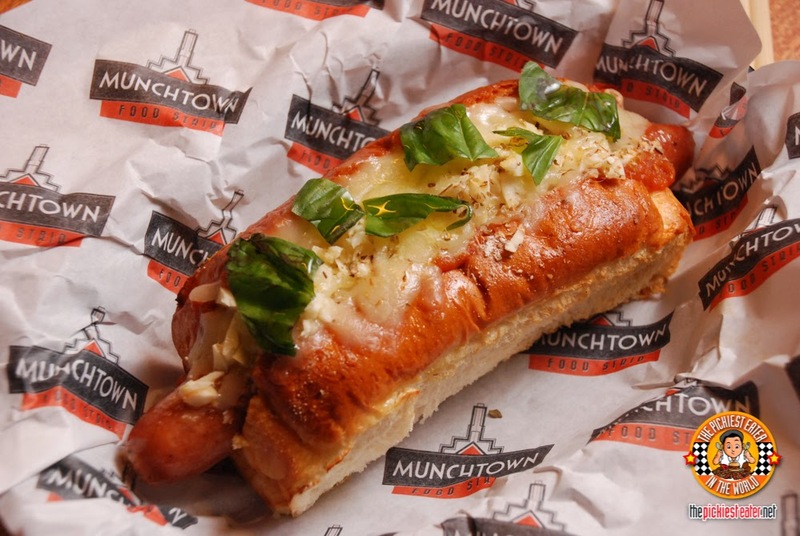 This is one of Munchtown's specialties. Of course, coz who doesn't like pulled pork? Not my husband that's for sure! 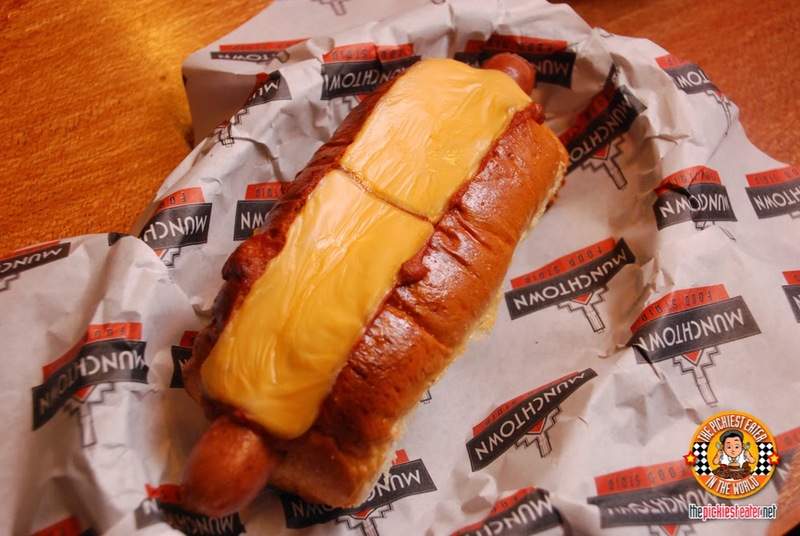 Aside from the hotdog, it's stuffed with pulled pork, some cheddar cheese, and again a blanket of amazing cheddar cheese. 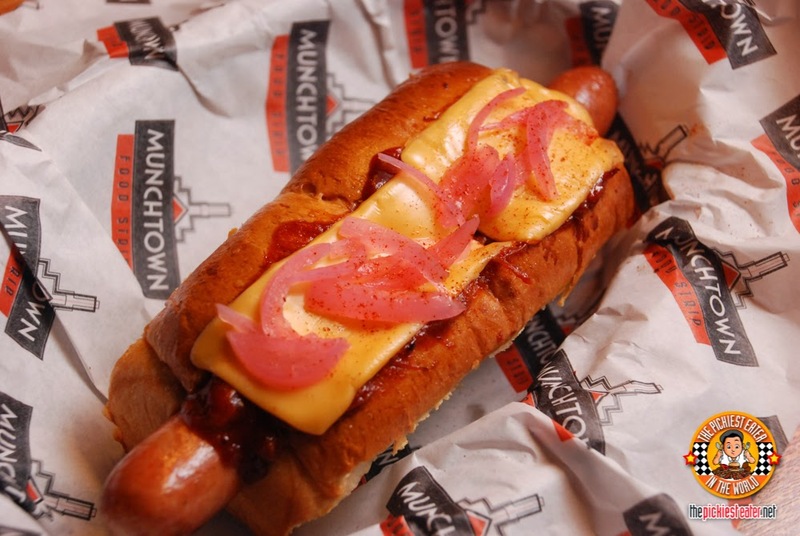 Surf Dog is Munchtown's Hawaiian style hotdog. It's got some sweet pineapple, plus some bell peppers too to add more kick! Is the dog made out of poodle? Of course not haha! Nothing but good ol' caramelized onions, brie, and then topped with chunks of dill pickles! This was one of my favorites. I love pizza, I love hotdogs, and now they're all together inside their delicious bun with some rich mozzarella cheese! Definitely can't go wrong with this one! The name says it all. 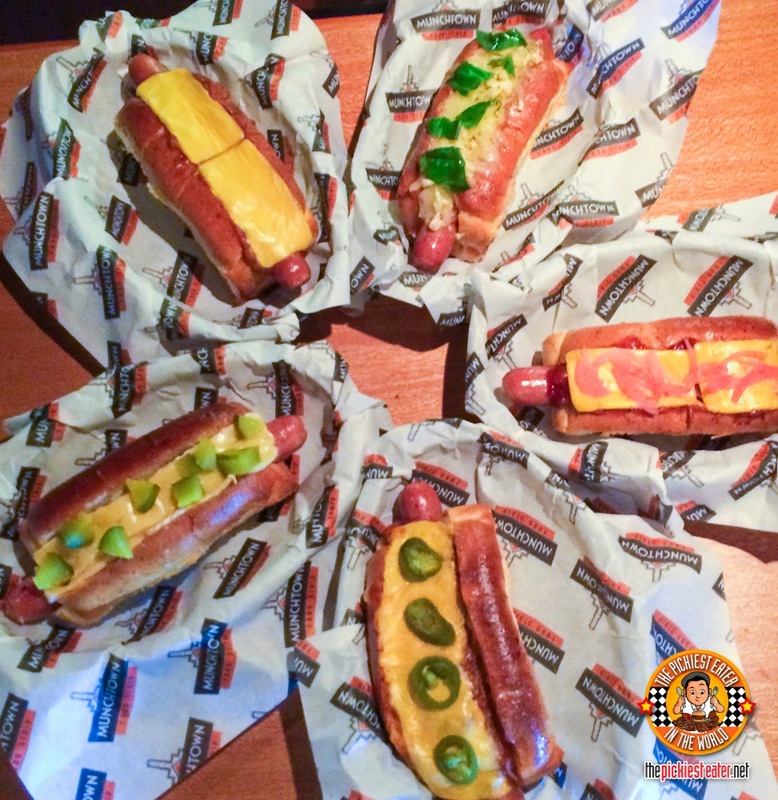 Almost everything you can think of that would go great with a hotdog is here! Starting with excellent meat sauce, caramelized onions, melted cheese, and slices of jalapeños. Think you've seen everything? Bet you haven't seen a taco dog, 'coz I havent. 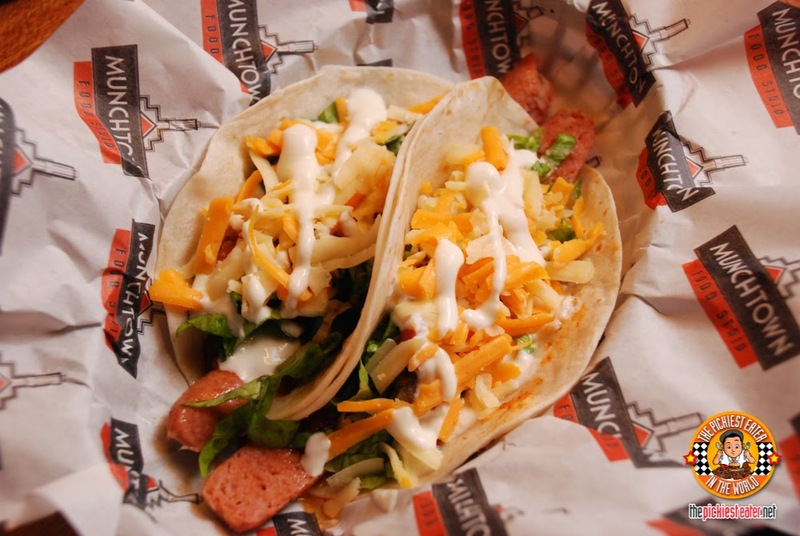 Munchtown goes the extra mile by creating a Mexican style hotdog by using tortillas instead of buns! In the midst of the hotdog, a burger patty got though. 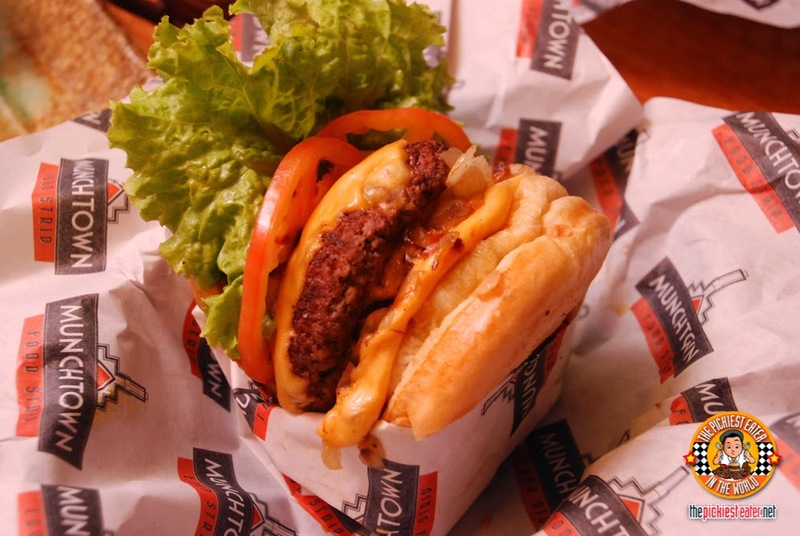 This is Munchtown's Black Angus Cheeseburger. A perfect balance of meat and cheese with crunchy veggies. Just the kind of burger that I personally like. The patty is juicy and very flavorful! 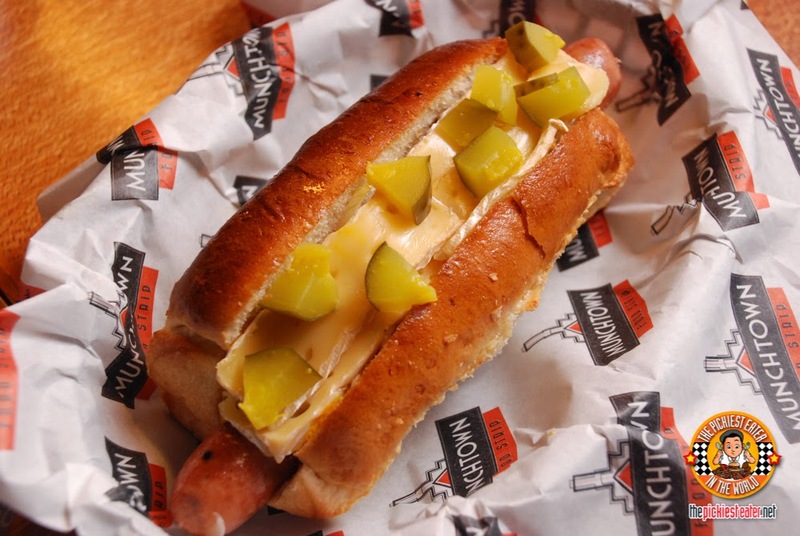 And let's not forget that gooey cheddar cheese! 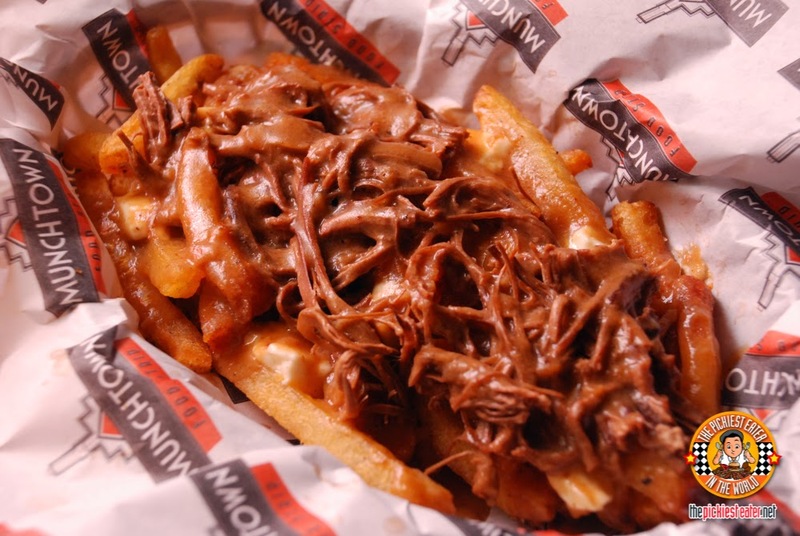 And because your hotdog needs a buddy... here are some rich fries to go with it! 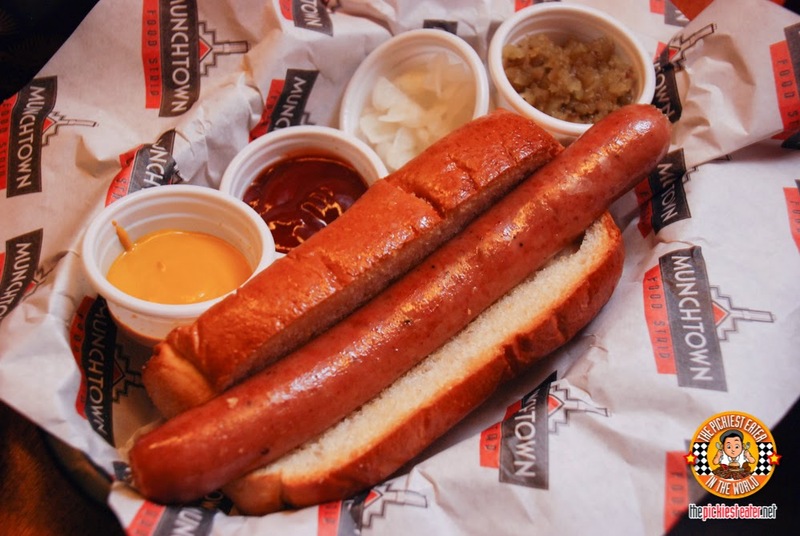 As exciting as their hotdogs are, Munchtown made sure that they also offer extra special fries. 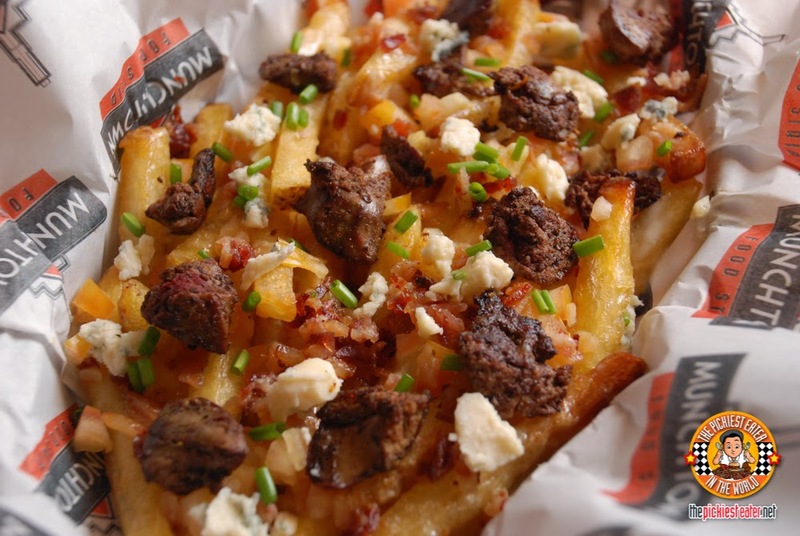 Like this Blue Cheese Fries with Chicken Liver. 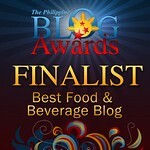 I'm not too fond of liver, but I'm so sure my sister Raquel will go nuts over this mix of flavors and textures! Now this one's more my style. Poutine! With Smoked Pulled Pork! It's actually already a meal in itself. 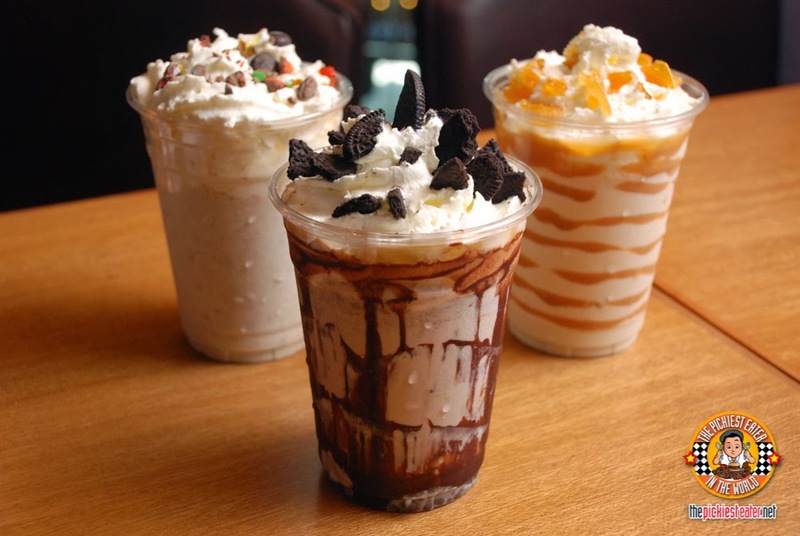 So the next time you go watch a movie and want to have hearty options on what to munch on in the theater while watching a movie, give Munchtown a try! They can deliver your food to you inside the theater!